One foot in front of the other… that's the way most people enjoy Pinnacles National Monument. 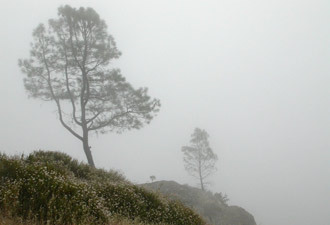 Pinnacles is a hiking park. People enjoy the challenges of hiking in the high peaks or traversing the “Steep and Narrow.” The Bench Trail provides an easier walk and opportunities to see wildflowers. The shady oaks and pines create a tunnel of green on the way to Moses Spring before getting to the Bear Gulch Talus Cave. The park's trail system will take you through five plant communities. On the Old Pinnacles trail you will see four of them as you hike through shady oak woodlands, travel through a riparian (stream) area, scramble through the Balconies Talus Cave (bring a flashlight!) and end up in shrubby, green chaparral with amazing views of the pinnacle rock formation. The fifth plant community, the grasslands, provides a perfect place to enjoy the sunshine and discover the history of the area; people for generations have been adapting to living here. 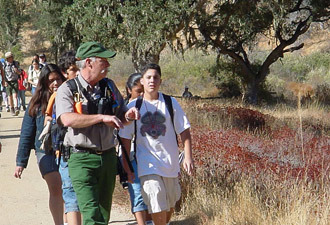 Before you head out on your hike, join a ranger for a program. As you continue to hike around Pinnacles National Monument, you'll start to discover more of its hidden treasures, like hummingbirds, frogs, butterflies, bats, and the California condor. The California condor is a success story in the making. 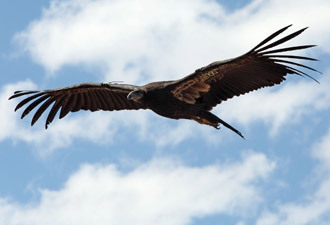 Condors were reintroduced to the park in 2003, and the population has been experiencing slow growth. Bring your binoculars when you are hiking to look for condors and the other birds of Pinnacles. If you hear buzzing and whirring on your hike, look for bees! There are almost 400 species of bees at Pinnacles. If you think that is a lot in one small area, you are right. Interesting fact about the bees — different species are active at different times of the year, which reduces competition for food. Bees, bats, condors, there is a lot of wildlife to watch. While hiking, it's what's underfoot that brings everyone here, the geology. The rocky spires of Pinnacles have inspired artists to paint, photograph and write about the towering peaks. After persistent efforts by people in the local area to protect to Pinnacles, President Theodore Roosevelt made it a national monument in 1908. Since then the Pinnacles landscape has gone through several changes. As seasons shift, and temperatures vary, native populations of vegetation and wildlife compete with invasive species. Changes to the environment will continue into the future, and every time you visit, your experience will be different. The park is a hidden little gem, not far from major metropolitan populations in the San Francisco Bay area. If you program the directions into your GPS and come on a week day or in the off season, you will have the park nearly to yourself. It's your park to enjoy, so come experience it!